Master Sergeant Frank Woods is one of the main protagonists in Call of Duty: Black Ops. Woods was part of the Studies and Observation Group (SOG) along with Alex Mason and Joseph Bowman. He is also one of the main protagonists in Call of Duty: Black Ops II and Call of Duty: Black Ops: Declassified. 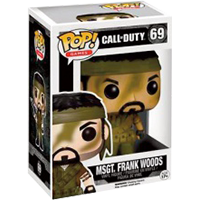 Now he can be on your shelf as well as one of the latest in a line of Call of Duty Funko POP! figurines. These vinyl figures stand around 9cm tall. Packed in an illustrated window box.